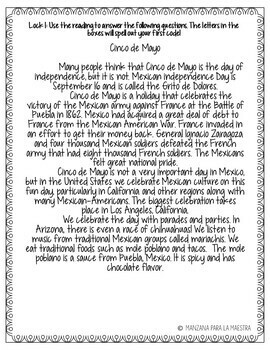 This Cinco de mayo break out activity is a great way for students to gain factual knowledge about the holiday, while also having fun. 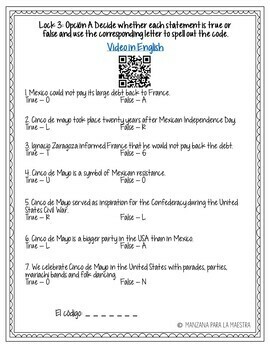 Students must complete five puzzles all in English to escape: read the English passage and answer the questions to reveal a code, complete a special code breaking word search, order the numbers written in each sentence to reveal a code, make a papel picado that reveals a secret message and decode the message from the pictogram. Students earn one puzzle piece for each activity they complete. This break out is appropriate for middle school level students in a Social Studies or a Spanish classroom (grades 5-8). Unlike other breakout room kits, this requires no additional purchases or materials other than what is included in this file. There is a five station option or a four station option for struggling students or classes, making it easy to differentiate. This lesson is engaging, and excellent practice for using present tense. 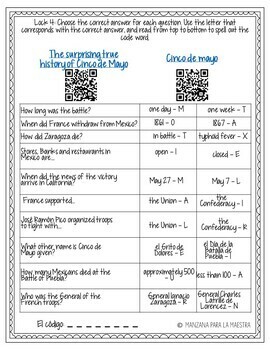 ★five cinco de mayo puzzles, a combo of fun and informational! 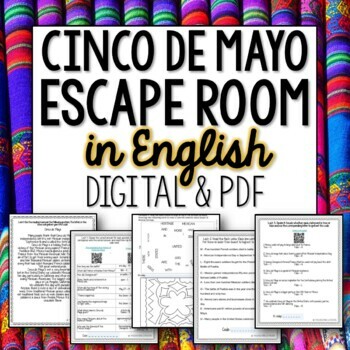 Get free escape room award certificates here!